We slept in and missed breakfast at Saana which I was a bit disappointed about, but we eventually made it out of the door and were on our way to Magic Kingdom. 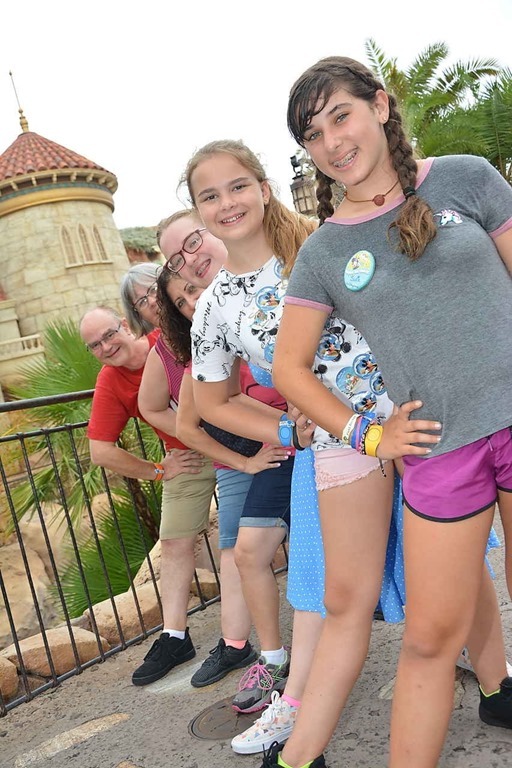 My friend from University was in Disney for just 1 day (they are going on a cruise tomorrow) and we were meeting up with her and her daughter in Magic Kingdom. We wanted to have some lunch before we met up with Alanna, so we started at the Tomorrowland Terrace, but it was closed, so we walked around to Cosmic Rays. This looked like it had a new more limited menu and we didn’t really see anything we fancied. We had a quick debate, and decided we were being silly and we should just go to the Columbia Harbour House as we like it there. Someone in Columbia Harbour House gave Molly some stickers, so she covered herself in them. I don’t rally know why, but she thought it was good…. 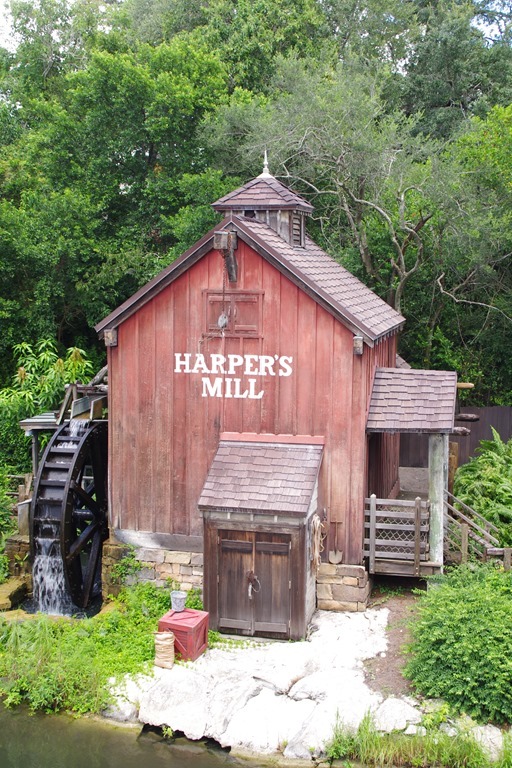 As we walked over to Columbia Harbour House, I placed our order via the My Disney Experience app, and so when we arrived to huge queues, we could just walk past them all and collect our food. It worked really well, but it doesn’t work if you are on the dining plan, you have to charge your meal to a credit card. The app offered us choices, so for my Tuna Sandwich, I could have it with Chips (Crisps), Apple Slices, or Fries. Phil and I both chose Fries. The girls had Fish / Shrimp with Fries. When we collected our food, the Sandwiches came with crisps, and then we also had fries as well. Considering we have mostly been sharing meals up to now, there was an enormous amount of food. 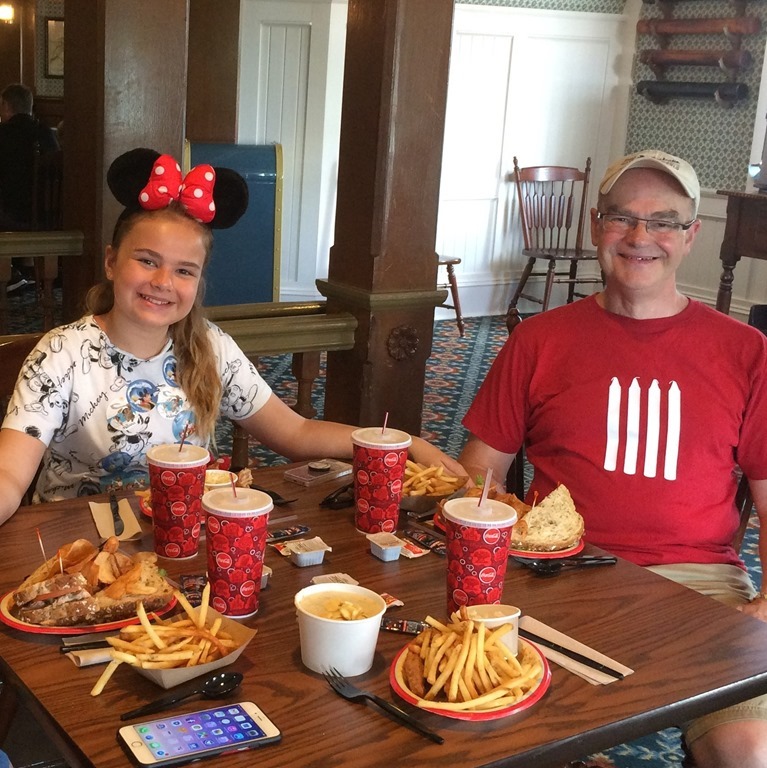 While we were eating I had a message from Alanna (my friend) to say they had arrived at the hotel and we should meet them at 2pm for a fastpass at Tomorrowland Speedway. 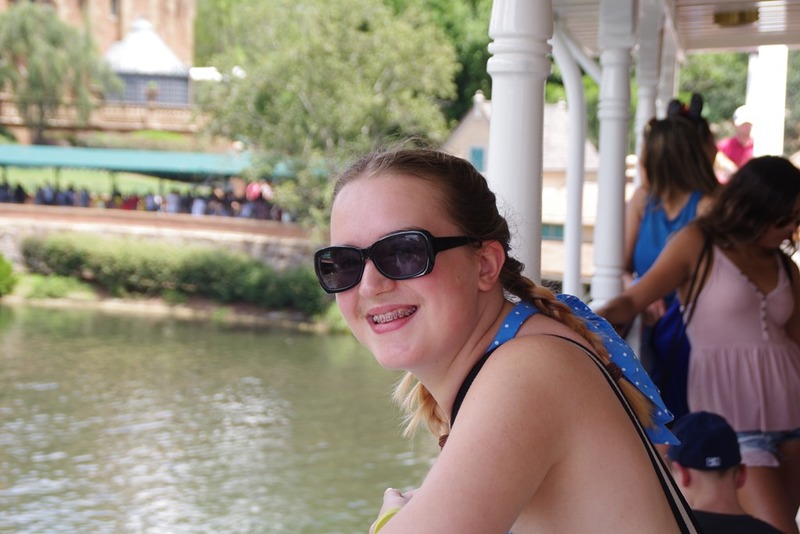 We had about an hour, so we took a ride on the Liberty Belle Riverboat. I thought, foolishy, this would be a cool relaxing way to pass half an hour. It was pleasant enough, but it certainly wasn’t cool…. I came off it very hot and melting. It’s quite a nice place to take a few photos though. 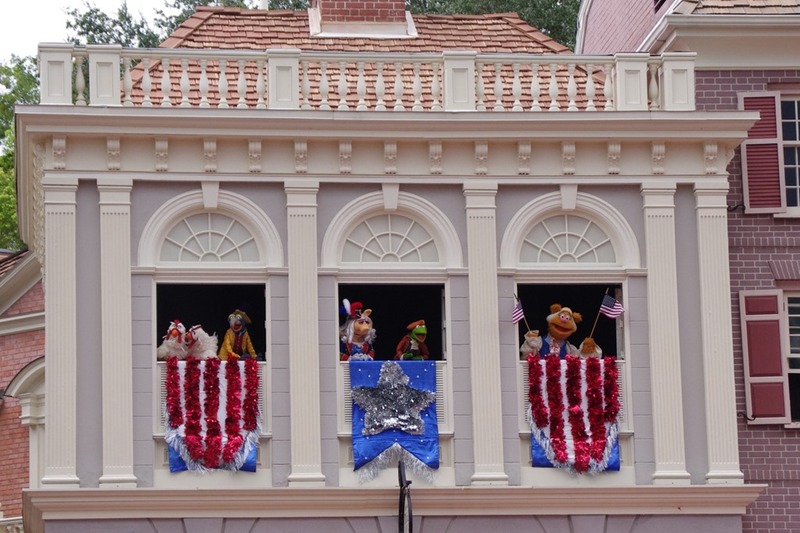 After we got of the boat, the Muppets show was just starting outside the Hall of Presidents, so we found a spot on a wall and watched it. It was quite good. 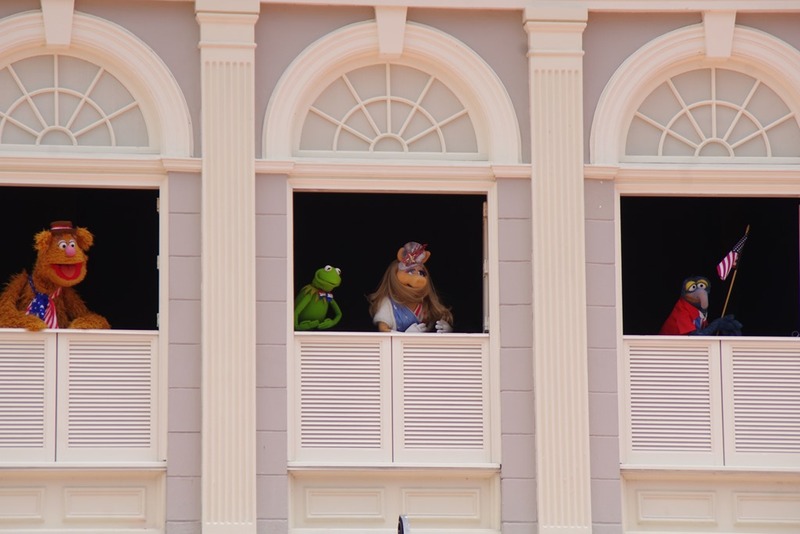 I thought it would be animatronic, but I think they were the real Muppets. This was quite entertaining. After the show, we walked over to the Speedway. I thought it would be a little while before Alanna arrived, so we got ice creams. Why we needed ice creams after this enormous meal I’m not sure, but it seemed like a good thing to do while we wait. 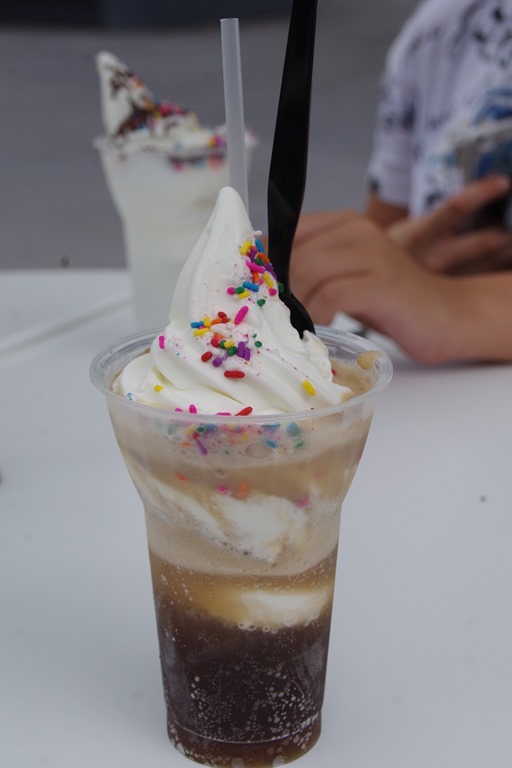 We have always gone to Aunty Gravity’s in Tomorrowland for Coffee Floats, they are my favourite treat. And they are gone I had a coke float, which was nice, but I didn’t really need it and I really wanted a coffee one. 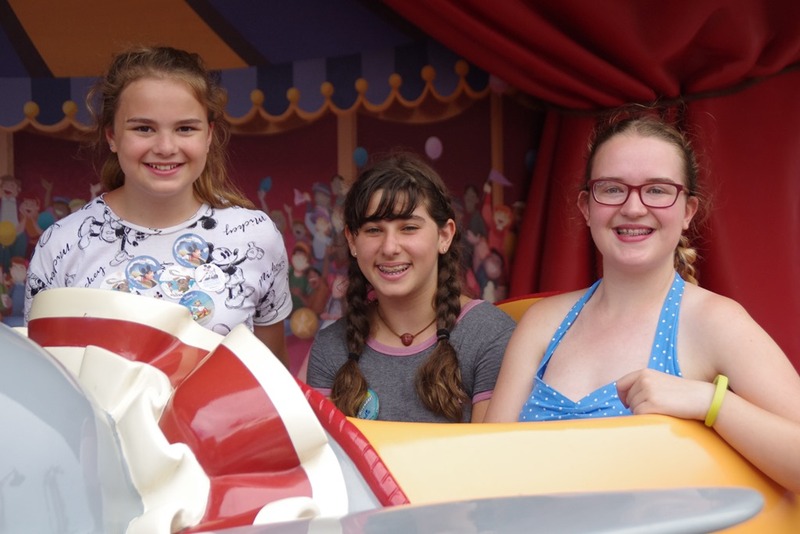 While we were say the sky started to turn very grey, and I got a message from Alanna to say they had arrived and the Tomorrowland Speedway was closed due to rain. We found each other and said a very quick hello while we debated where to hide from the rain. We decided to run over to Monsters Inc Laugh Floor. 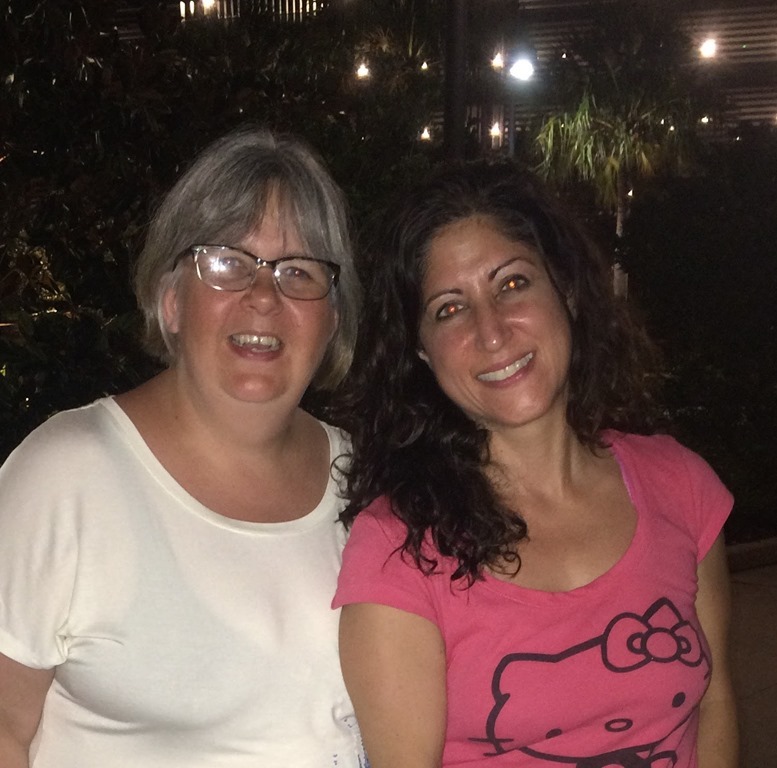 We haven’t seen each other in about 20 years, but those years immediately disappeared and we were catching up on old friends and what we’d been up to. It was great to chat. Just as we got under cover the heavens absolutely opened. We were very lucky as we would have drenched. We had a little wait and then we went into the Theatre. Alanna’s daughter had a friend along with her, and he thought he knew the spot to sit in to be ‘That Guy’, so he put Sadie into the appropriate seat. However, she wasn’t ‘That Guy’, but about halfway through the show there was a joke about jobs, and he said ‘you could sell portable seatbelts’ and I appeared on the screen because I had my camera strap right across my body and it did look like a seatbelt. It made me jump as I was just quietly minding my own business. We came out of Laugh Floor and it was still raining quite heavily, so we ran straight across to Stitch. This isn’t one of my favourite rides, but it was dry and we could wait undercover so it was a winner at the time. After Stitch the rain had stopped, our fastpass time was over for the Speedway but we walked over there and we were able to use the fastpasses later. Katie and I were in a car together, and it was quite hair-raising! 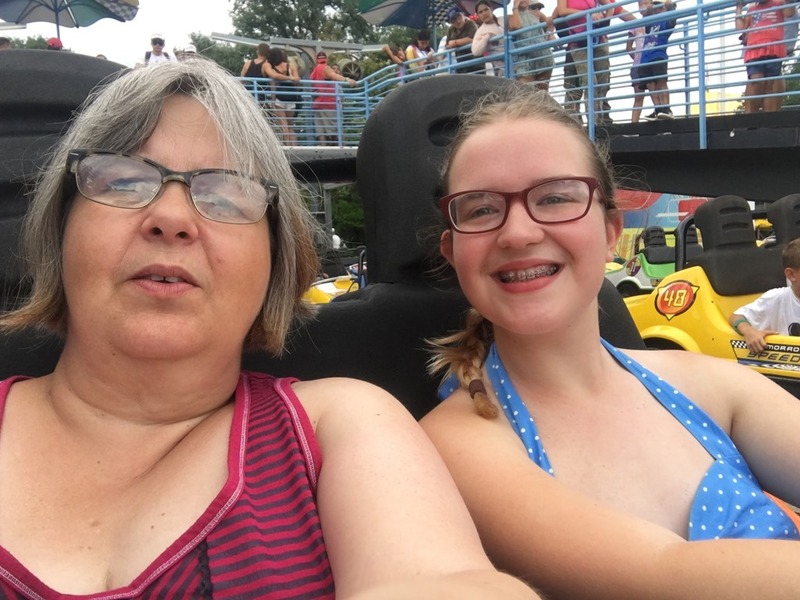 She has had driving lessons, but they didn’t help her with these demon cars. I think they are pretty much un-drivable actually. We had fastpasses for Big Thunder Mountain, so we walked around to Big Thunder. I rode this last week with Molly and we were sliding all over the place, but I sat with Phil this time and it was much better. We are more evenly sized. We had about an hour before our Splash Fastpass time, and Sadie wanted to ride Haunted Mansion. Katie rode it last week but she wasn’t keen to try it again, so we went to Pirates again and arranged to meet Alanna and Sadie afterwards. 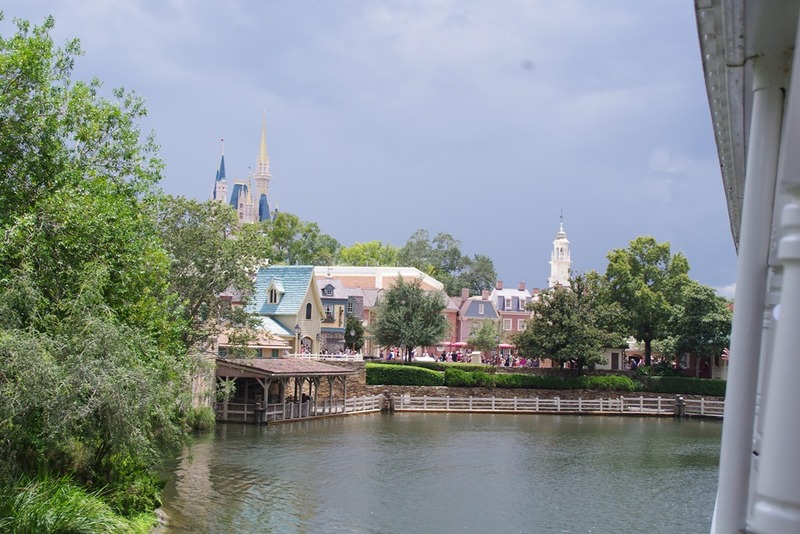 Pirates is a family favourite, so we enjoyed our ride, and then walked back to Splash Mountain. 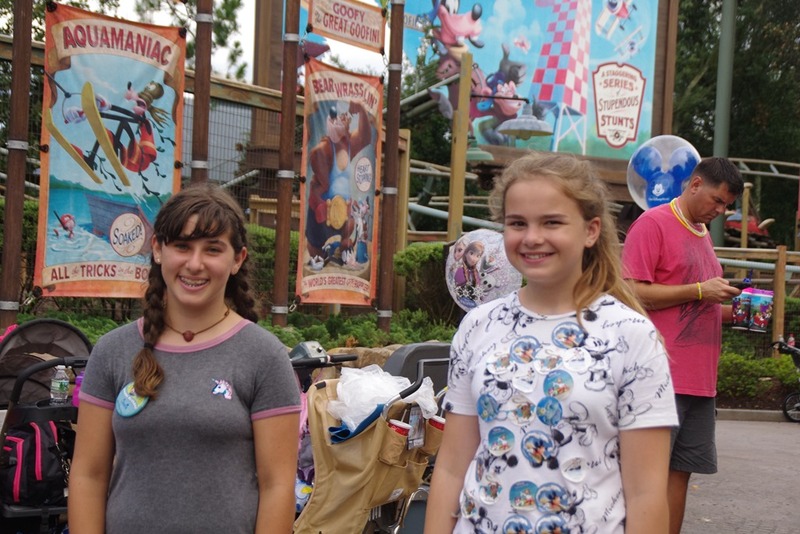 Alanna, Sadie and their friend had ridden while we were on Pirates, so we met them at the end of the ride. Sadie’s friend left after Splash, so it was just the 6 of us for the rest of the afternoon. 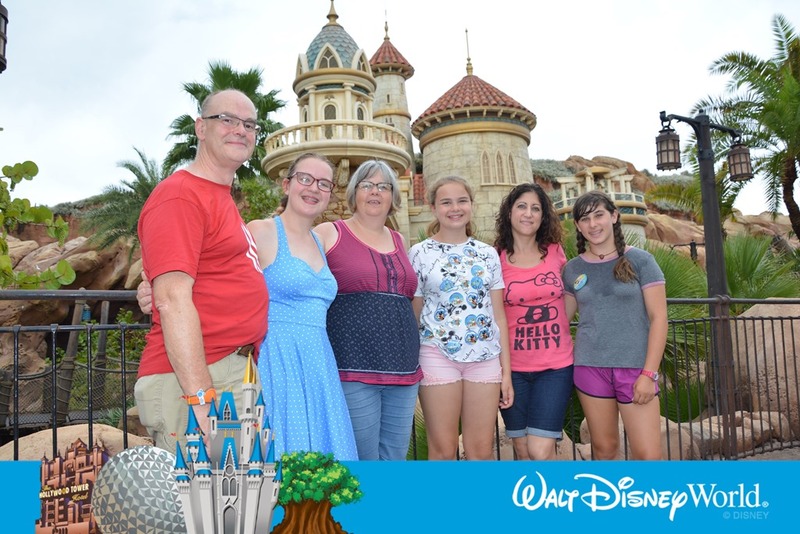 So I thought we’d get a Photopass taken as well…. He took a few nice ones, and then some very strange ones. Molly and Sadie got chatting, so they rode together, and Alanna and I had a catchup on the ride. It’s a little hard to hear on there when you are trying to find out what has happened over the last 20 years! I was thinking, turn down the music…. 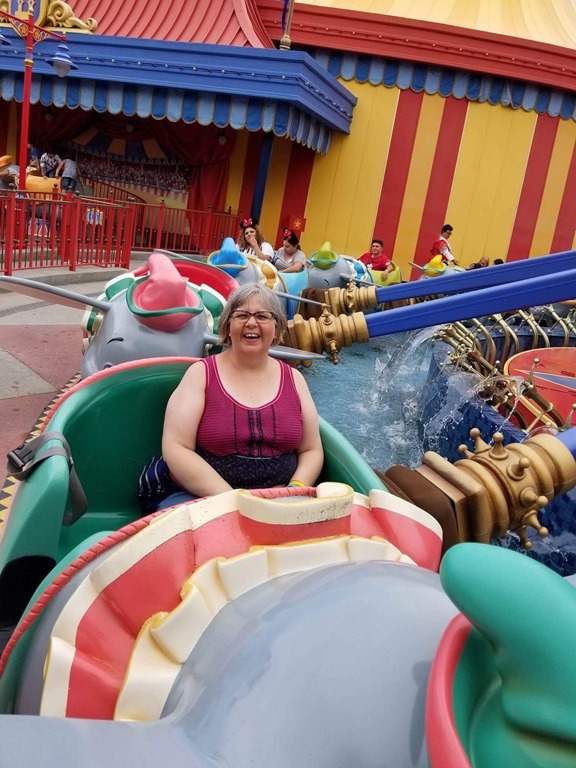 After Little Mermaid, we were all able to get Dumbo fastpasses, so we walked more or less straight on there, I think the fastpasses started 5 minutes after the time we booked them. After Dumbo, we tried to get another fastpass. Alanna was able to get Goofy’s barnstormer but I just couldnt get it to pop up. I was looking for 4, and she was only after 3, so maybe that was it. Molly and Sadie took the fastpasses while the rest of us waited for them. While they were riding, we decided that we were ready to leave the park, Alanna and Sadie were hungry, and they particularly like Kimono’s, a sushi restaurant at The Swan. We haven’t every really had Sushi, but we like other Japanese food, so we checked the menu and decided there were a few things we could order, and agreed to join them. We all got the train around to the entrance of the park, and then popped into the shops for a few souveniers. I’d been fancying a t-shirt, and decided that this was exactly the moment to buy it as I wanted something fresh to wear in the restaurant. We all got the bus to the Swan, and found the restaurant, and Adam, Alanna’s husband was waiting for us there. He’d arrived in Orlando a bit later in the day. 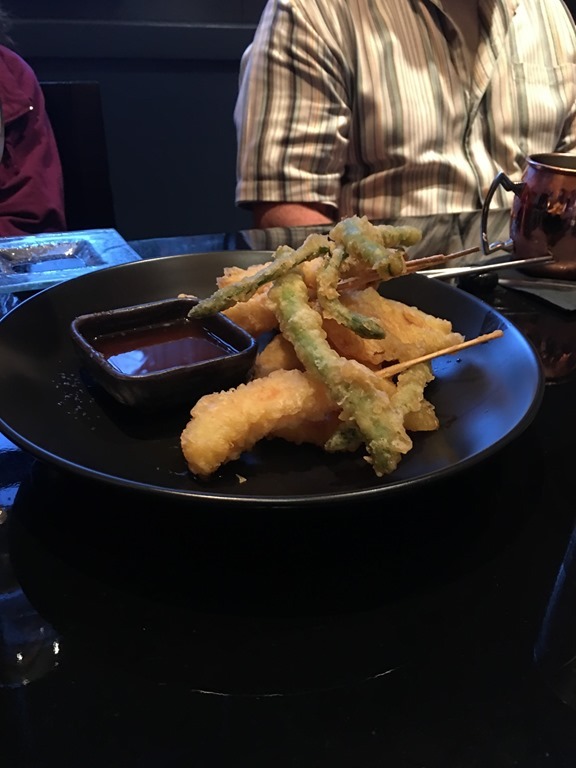 We ordered some Tempura, and Chicken Katsu which I was familiar with, and they recommended a Dragon Roll, so we tried that as well. I wish I had taken a photo of the dragon roll as it looked very impressive. We had a lovely evening, and it was great to be able to catch up with up The Little Mermaid playing in the background! I think the last time I saw Alanna, Katie was 1, that would be 18 years ago, so we had a lot of catching up to do. We talked for ages, and then we had to catch the bus back to our hotels. The easiest way was to go via Disney Springs, so we both got a bus to Disney Springs. 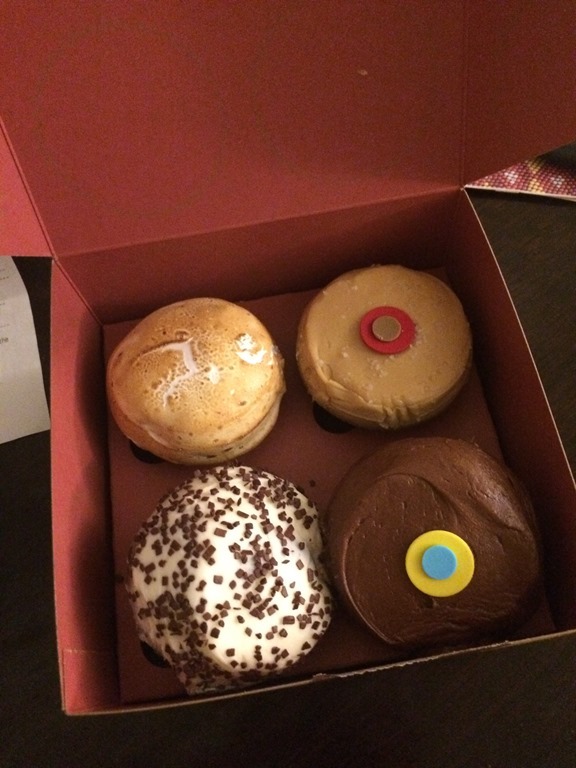 While at Disney Springs, it seemed a good idea to go to Sprinkles and pick up some cupcakes. These all looked amazing, it was really hard to just choose one each. We were still quite full, so we took them back to our hotel room to eat later. We walked back to the bus stops, and said our goodbyes. Alanna was only in Orlando for one day as they are off on a cruise. Hopefully it won’t be another 18 years before I see her again. 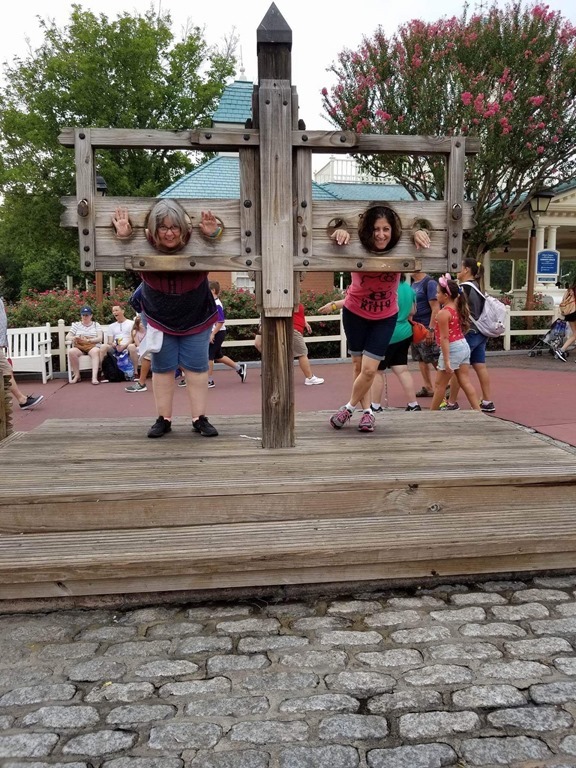 ← Day 19–Epcot and a move….